Provide an amazing user journey with outstanding landing page designs only at Webgen. In just a few minutes, create the perfect website with our stunning, industry-tailored website templates and themes only with Webgen. With Webgen free website creator, build your captivating e-store and sell your products and services while promoting your brand. Webgen provides you drag & drop feature and beautiful predesigned templates to make a free website without needing any coding skills. Creating your website with Webgen is that easy. With Webgen services, make sure you are effectively reaching your audience no matter what browser, electronic device and search engine they might be using. Creating brand visibility has never been simpler and more necessary than it is now. With no requirement of website coding skills. You can make a free website by customizing any of our themes with our intuitive, drag & drop design interface to help you bring your vision to life. 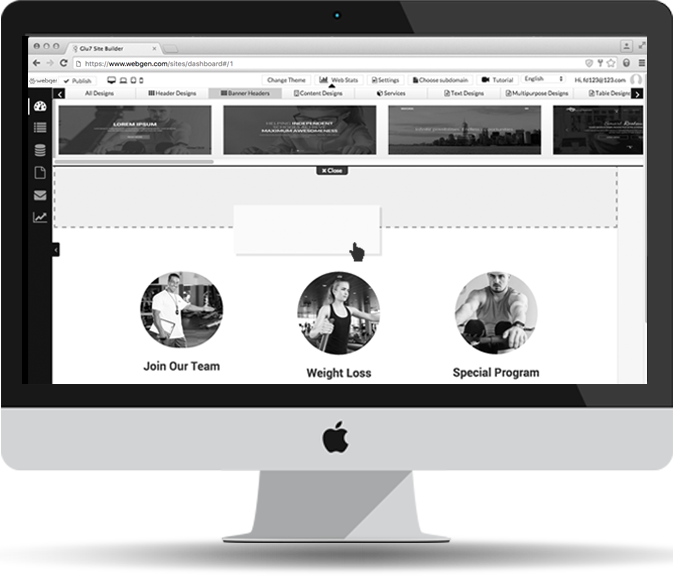 Create the perfect website with an extensive and free website builder that helps you stand out and be extraordinary at what you do. There is no one perfect way to connect with your audience, the trick is to know your audience and understand their expectations and needs. With Webgen website builder, create a more intimate connection with your audience by using our user-friendly, in-house email marketing and scheduling system. We all like it when someone remembers our birthday. Monetize your website or e-store instantly with our streamlined e-commerce functionality and other website aspects like blogging. Creating your amazing website has never been this simple and fun before. © Copyright - 2016 - webgen, All Rights Reserved.